Scott Snyder intends to take Batman to new and "weird" places after DC's Convergence event ends this June. While Batman has definitely dipped his toes in the weird end of the pool on occasion, the character's modern formula has, for some time now, been fairly consistent. Brood, pummel villains, brood some more, repeat. That being the case, long-time Batman writer Scott Snyder has recently indicated that the end of series' current Endgame story arc will bring about some of the biggest changes the character has seen in a very long time. "I'm not going to spoil it specifically, but I can tell you unequivocally, it is the boldest, weirdest, biggest thing we've ever tried on the book," said Snyder in a recent interview. "When Endgame ends, it will have changed the Bat-mythology in a huge way. When we pick up again in June, I think you'll be stunned to see how far we're taking it, in that regard." That Snyder would be promising something big isn't surprising. Now on his fifth year as the writer behind DC's Batman comic, he's helmed a number of high profile storylines yielding lasting consequences for Gotham and its denizens. Endgame, for instance, has already established that the Joker could be a literally immortal being. The big question, of course, is just how big of a change readers can actually look forward to. While Snyder is staying understandably mum, a released preview cover for Batman issue 41 looks as though it contains some pretty drastic clues. 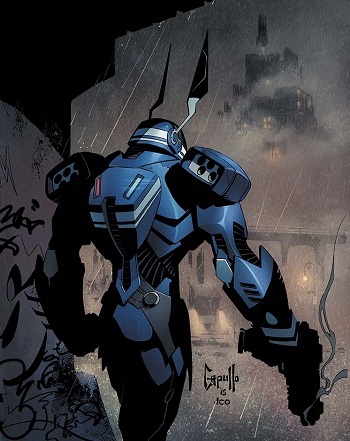 The cover depicts what looks like a new version of Batman wearing a mechanized combat suit and wielding a gun. While the armor itself could be a big shift on its own, we're more interested to see what could drive good ol' Bats to rescind his "no guns" rule and start using firearms (again). The answers should come next Wednesday when the final issue of Endgame lands in comic stores. Issue 41, meanwhile, is scheduled to release this June following the end of DC's Convergence event.